More news from the YACHTZOO brokers as they sign the 43.8m motor yacht Deep Blue II for sale, arriving in Fort Lauderdale this week. An all-aluminium tri deck motor yacht, she was built by Oceanco in 1996 as Ultimate to a design by the A Group. 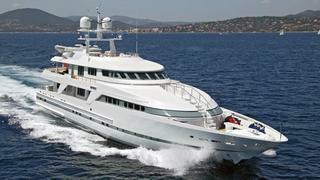 She was completely refitted in 2007/2008 with an interior by Paolo Rossi and accommodates 10 guests in five staterooms including a main deck master suite. Twin 2250hp MTU engines give Deep Blue II a cruising speed of 15 knots and of special note is that she's a past winner at the ShowBoats International Design Awards. Deep Blue II is asking $15,900,000.